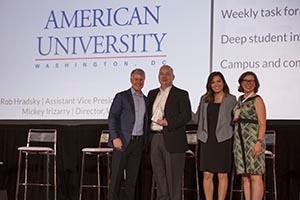 AU Honored for Excellence in Sexual Assault Prevention | American University Washington D.C.
Robert Hradsky and Mickey Irizarry (middle two) accept the EVERFI award on AU's behalf. The Title IX civil rights law prohibits sexual violence, and American University devotes considerable energy towards combating sexual assault on campus. Soon before the 45th anniversary of Title IX, AU was recognized for its commitment on this issue. EVERFI, a technology provider of educational solutions around wellness issues, honored AU with a 2017 excellence in sexual assault prevention award. For an issue both troubling and challenging, Student Wellness Center Director Pritma “Mickey” Irizarry is happy to see signs of progress on sexual assault prevention. “It’s just a nice way to acknowledge that there is strong work being done at AU. And it’s not happening everywhere,” she says. When Hradsky started at AU in 2008, he did a listening tour with students on campus. Students felt the university’s sexual assault prevention and response efforts were inadequate, so AU set up a Sexual Assault Working Group (SAWG) to bring together faculty, staff, and students. It was a way to evaluate current work, and make recommendations to better support students and the community. Now, there are weekly committee meetings with people across campus. Hradsky chairs the steering committee, with five subcommittees that cover specific areas: student advocacy and support; campus awareness and education; university policies and procedures; outreach and communication; and assessment. The assessment committee conducts a survey of undergraduate and graduate students to measure attitudes, prevalence of assault, and adequacy of resources. “If we find, for example, that students are confused about resources, or if we find that incidents are occurring in a particular space, that helps us to really target our training efforts. We make sure that we are addressing those concerns,” says Hradsky. AU has evolved in other ways. Hradsky was formerly Title IX coordinator, but AU designated a full-time program officer (now Regina Curran) responsible for investigating and responding to complaints of interpersonal and sexual violence. AU also hired its first victim advocate, and now the university has two people in that role, Sara Yzaguirre and Maya Vizvary. The work done by SAWG blossomed into the Office of Advocacy Services for Interpersonal and Sexual Violence (OASIS). AU has found numerous—and sometimes creative—ways to reach students. All incoming students, including transfer and graduate students, take an online course called Think About It. Incoming undergraduates are mandated to participate in an in-person, 90-minute workshop session called Empower AU. The university also worked to incorporate sexual violence awareness issues into AUx1, a pilot college introductory course that is slated to become mandatory. There is information on the back of bathroom stalls about how to report sexual assaults, and AU uses a phone app called UASK DC that includes information on contacting campus police and getting medical/counseling help. Hradsky and Irizarry emphasize that many people are working—and continuously needed—to prevent sexual assault at AU. The university remains on the Education Department’s list of schools under Title IX investigation, but they feel confident that the institution is making strides. “I think this award is something that the entire community should be proud of. It’s not a situation of, ‘We’re done.’ This is showing that, ‘We’re doing a good job. Let’s keep it up,’” Irizarry says.